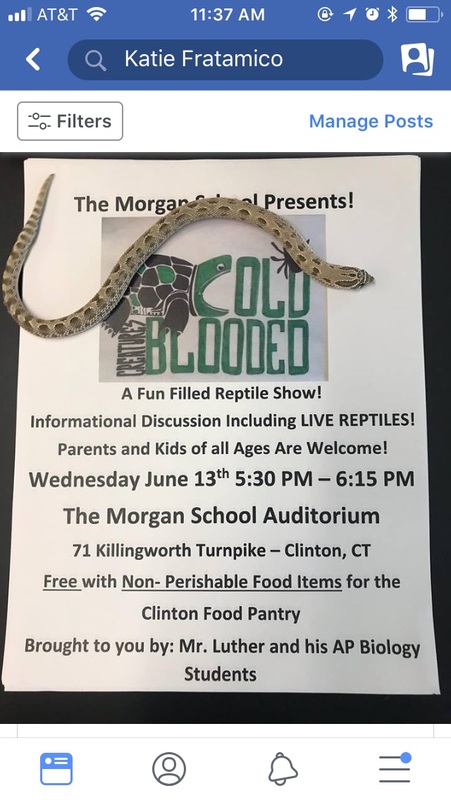 Every year, Biology teacher Mr. Luther and his AP biology students host Cold Blooded Creatures, an exciting reptile show. The show includes live reptiles and many fun, interactive games. Parents, students, and children of all ages are welcome to come. The show will be hosted on Wednesday, June 13th from 5:30pm to 6:15pm in The Morgan School Auditorium. The show is free. Anyone is welcome to bring non-perishable food items for the Clinton Food Pantry. If you want to learn a few interesting facts and have a fun time, come and enjoy.